In the thread about Ashbridge and Russell Carhouses, there has been the odd mention of cars using the crossovers at Russell Yard. 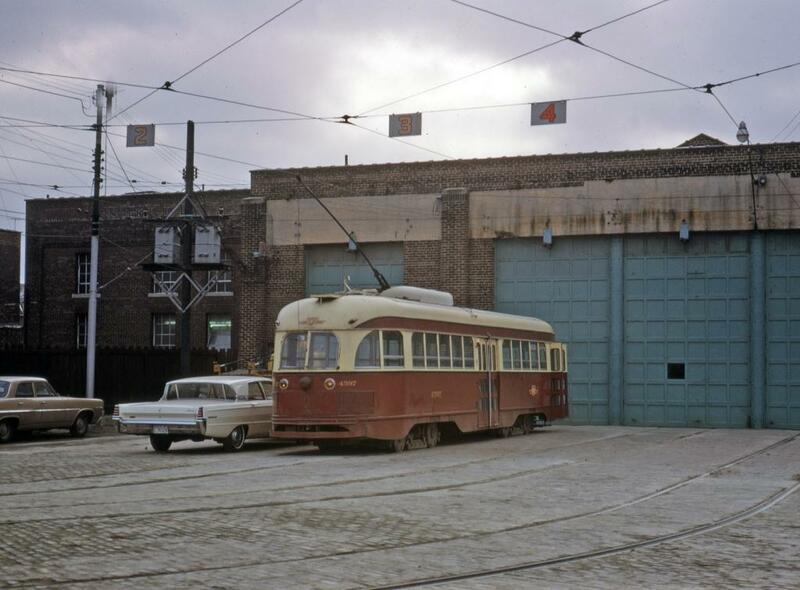 Until the late 1960s, there were two crossovers at this location. One still exists on Connaught south of the east gate where the double track merges into single track. The other was in the “trailer yard” west of the Traffic Office. The track which now is a westbound bypass track off of Queen used to connect to the eastbound track beside it just behind the Traffic Office. This was changed so that cars could enter the yard westbound from Queen to couple into MU trains. One use for the crossovers was that occasionally a car would be spotted in the carhouse facing south. This was usually done to put the front truck over the wheel truing equipment at the north end of the pits. This activity stopped with the arrival of the CLRVs. John F. Bromley sent along three photos of cars facing the wrong way at Russell. 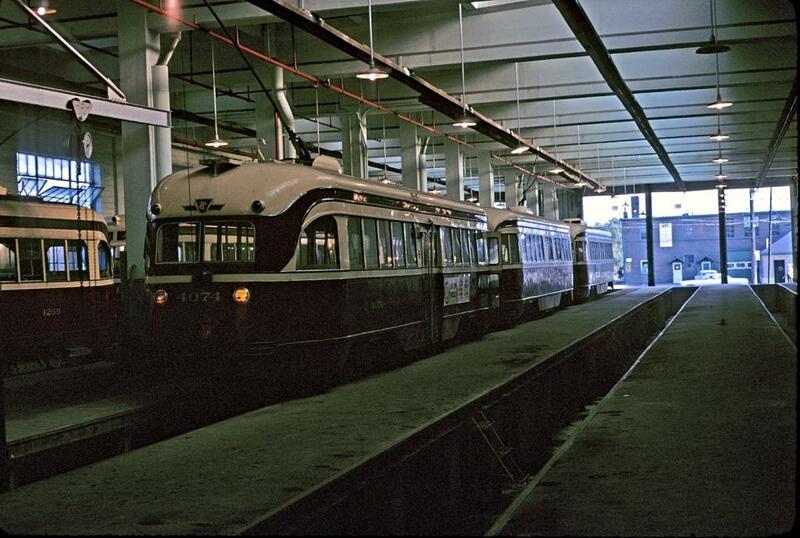 Here is 4074 facing south on Track 2 inside the carhouse, nose-to-nose with another A-1 class car (identifiable by its distinctive trolley shroud) on September 21, 1965. Ex-Cincinnati car 4597 sits outside of the carhouse facing south on Track 2 on December 17, 1966. 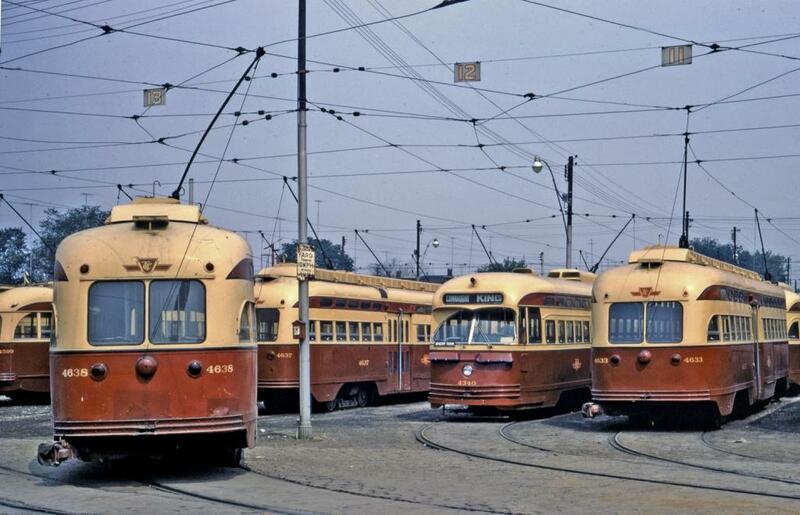 Toronto A-6 class car 4340 faces south to Eastern Avenue surrounded by ex-Cleveland 4600’s with ex-Cincinnati 4599 partly in view. The date is July 26, 1967. The crossover on Connaught Avenue will be removed later this year when the special work at Russell Yard is replaced. 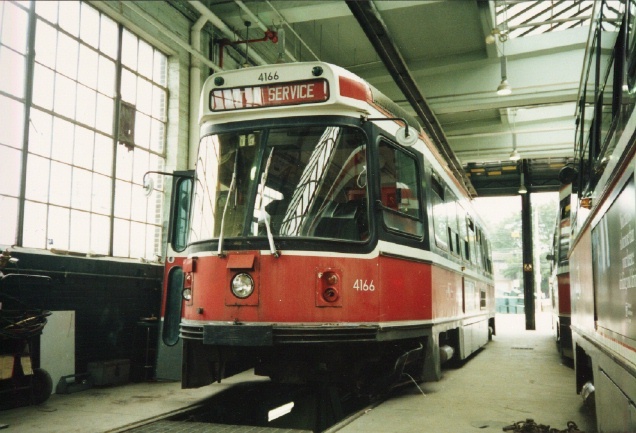 The TTC has not yet worked out the details of completely replacing the yard while keeping it in service. Updated at 5:10pm: Robert Lubinski sent in this view of 4166 facing south on Track 7 on July 21, 1991.